China has urged the Damascus government and the armed opposition to immediately begin a political dialogue, adding that it will be open to any suggestions from both parties to resolve the crisis. “China holds an objective and justified position on Syrian issues and is positive about and open to any solution widely accepted by Syrian parties,” said Yang Jiechi, the Chinese foreign minister on Wednesday. He said the civil war had reached a “crucial stage”. 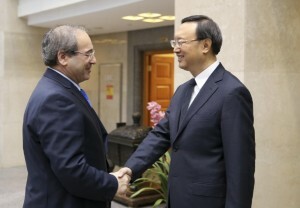 Yang’s comments were made after a meeting with Faisal Muqdad, Syria’s deputy foreign minister who arrived in Beijing on Monday to hold talks on ways to peacefully resolve the civil war in his country. “The visit is part of China’s efforts to push for a political resolution of the Syria issue,” a foreign ministry spokeswoman said earlier. China is backing the Geneva Communique, the June 30 resolution reached by the Syria Action Group – comprising Hillary Clinton, US Secretary of State, Kofi Annan, former Arab League envoy and Sergey Lavrov, Russia’s foreign minister. The communiqué called on both sides in Syria to immediately halt the violence, open negotiations, and form a transitional governing body. Russia has persistently called the Communique – which does not call for Syrian President Bashar al-Assad’s exit – remains the best solution to the conflict. The Chinese position comes amid of diplomatic flurry which has seen exchanges between Syrian officials, the opposition group and US, Russian, and Chinese envoys. On Tuesday, Song Aiguo, the Chinese ambassador to Egypt met with Moaz Al-Khatib, the opposition Syrian National Coalition chief in Cairo. Al-Khatib had earlier reiterated that he was “ready for direct discussions with representatives of the Syrian regime in Cairo, Tunis or Istanbul”. His announcement came after a weekend meeting with Lavrov on the sidelines of the 49th Munich Security Conference. Al-Khatib said he had received a “clear invitation” from the foreign minister to visit Moscow, in what could be the beginning of an international diplomatic effort to end the civil war. “Russia has a certain vision but we welcome negotiations to alleviate the crisis and there are lots of details that need to be discussed,” al-Khatib said after the talks. Al-Khatib was also due to meet Joe Biden, the US Vice-President and Ali Akbar Salehi, Iran’s foreign minister this week. Salehi said that his country met with Turkey and Egypt on the sidelines of the Islamic Summit in Cairo to examine ways to resolve the crisis. “We are optimistic,” Salehi said.